This oddly colorful nebula is the supernova remnant IC 443 as seen by NASA's Wide-field Infrared Survey Explorer, or WISE. Also known as the Jellyfish nebula, IC 443 is particularly interesting because it provides a look into how stellar explosions interact with their environment. IC 443 can be found near the star Eta Geminorum, which lies near Castor, one of the twins in the constellation Gemini. Just like human beings, stars have a life cycle -- they are born, mature and eventually die. The manner in which stars die depends on their mass. Stars with mass similar to the sun typically become planetary nebulae at the end of their lives, whereas stars with many times the sun's mass explode as supernovae. IC 443 is the remains of a star that went supernova somewhere between 5,000 and 10,000 years ago. 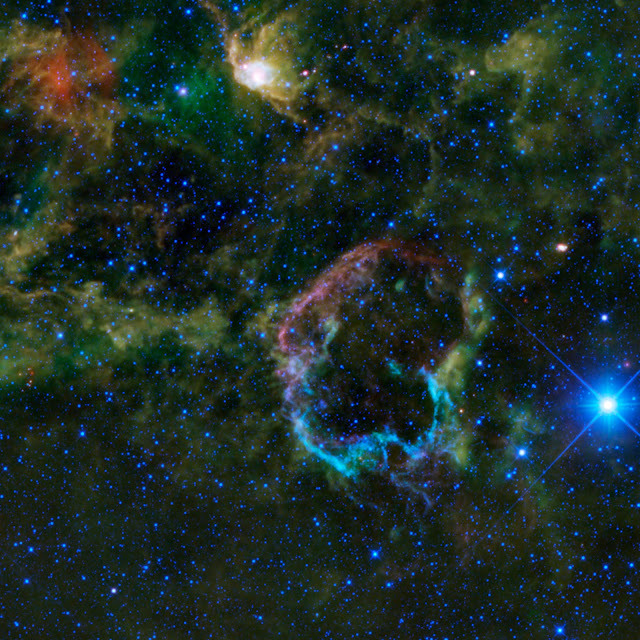 The blast from the supernova sent out shock waves that traveled through space, sweeping up and heating the surrounding gas and dust in the interstellar medium, and creating the supernova remnant seen in this image. What is unusual about the IC 443 is that its shell-like form has two halves that have different radii, structures and emissions. The larger northeastern shell, seen here as the violet-colored semi-circle on the top left of the supernova remnant, is composed of sheet-like filaments that are emitting light from iron, neon, silicon and oxygen gas atoms, in addition to dust particles, all heated by the blast from the supernova. The smaller southern shell, seen here in a bright cyan color on the bottom half of the image, is constructed of denser clumps and knots primarily emitting light from hydrogen gas and heated dust. These clumps are part of a molecular cloud, which can be seen in this image as the greenish cloud cutting across IC 443 from the northwest to southeast. The color differences seen in this image represent different wavelengths of infrared emission. The differences in color are also the result of differences in the energies of the shock waves hitting the interstellar medium. The northeastern shell was probably created by a fast shock wave (100 kilometers per second or 223,700 miles per hour), whereas the southern shell was probably created by a slow shock wave (30 kilometers per second or 67,100 miles per hour). All WISE featured images use color to represent specific infrared wavelengths. Blue represents 3.4-micron light, cyan represents 4.6-micron light, green represents 12-micron light and red represents 22-micron light. In this image, we see a mixing of blue and cyan in the southern ridge that is not often seen in other WISE images. The northeastern shell appears violet, indicating a mixture of longer infrared wavelengths from cooler dust (red) and shorter infrared wavelengths from luminescent gas (blue).